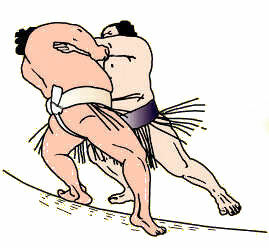 Hakuho s’est remis de sa défaite de la veille en battant Mitakeumi tandis que les deux ôzeki ont perdu face à des lutteurs moins bien classés. Hakuho (11-1) a sorti le sekiwake Mitakeumi (7-5) en 2,1 secondes dans la dernière rencontre de la journée. 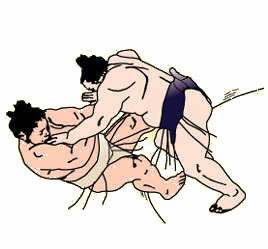 Au lendemain de sa première défaite contre le sekiwake Yoshikaze, Hakuho a maintenu son avance sur les maegashira Okinoumi et Hokutofuji. Okinoumi (10-2) a dominé Aminishiki (7-5) dans le premier combat du jour. Aminishiki, le lutteur le plus âgé à se frayer un chemin en division makuuchi, a été repoussé au bord du dohyô. 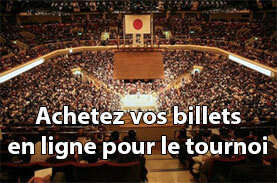 Il a tenté de projeter Okinoumi, mais son adversaire a tenu bon avant de le pousser. Pendant ce temps, Hokutofuji (10-2) a battu l’ôzeki Takayasu (8-4) et continue de rester dans la course au titre. 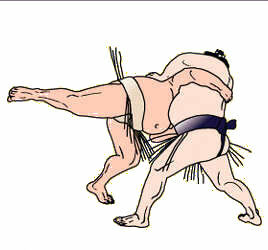 Ichinojo, quatrième au classement (8-4), a battu l’ôzeki Goeido (7-5). Les deux lutteurs se sont agrippés au centre du dohyô, mais le Mongol est parvenu à prendre le dessus. Endo a remporté son sixième combat consécutif en battant Myogiryu (6-6) avec une poussée frontale par oshidashi et est le seul à avoir un score de 9-3. Arawashi (8-4) et Takakeisho (8-4) ont remporté une majorité de victoires en battant respectivement Kaisei (7-5) et Tamawashi (8-4). Mongolian grand champion Hakuho made up for his previous day’s defeat by beating Mitakeumi at Kyushu Grand Sumo Tournament on Thursday, while the two ozeki lost to lower-ranked wrestlers. 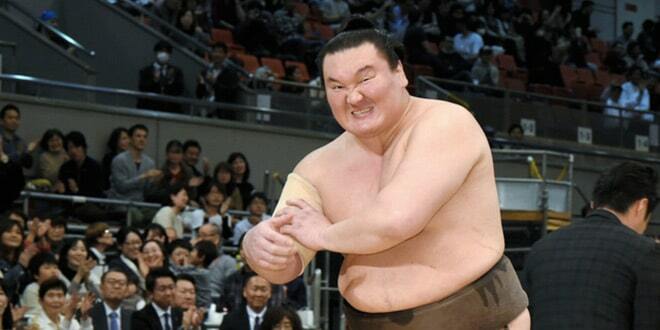 Hakuho (11-1), the only yokozuna remaining in the 15-day meet, ushered sekiwake Mitakeumi (7-5) out of the ring in 2.1 seconds, the day’s shortest match at Fukuoka Kokusai Center. 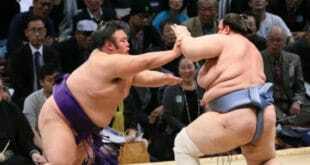 A day after suffering his lone defeat, to sekiwake Yoshikaze, Hakuho maintained his one-win lead over No. 12 maegashira Okinoumi and No. 3 Hokutofuji. 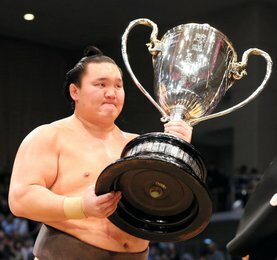 Hakuho is aiming for a record-extending 40th career championship in a grand tournament where the other three yokozuna, Kisenosato, Kakuryu and Harumafuji, have all pulled out. Okinoumi (10-2) overpowered 39-year-old No. 13 maegashira Aminishiki (7-5) in the day’s first bout. 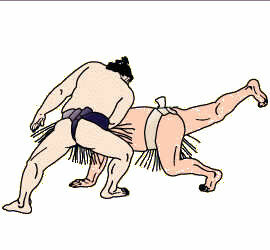 Aminishiki, the oldest wrestler to fight his way back into the elite makuuchi division, was forced back to the edge of the ring. 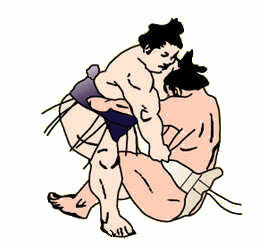 He attempted to throw Okinoumi, but the 32-year-old held on tight and pushed his opponent out. 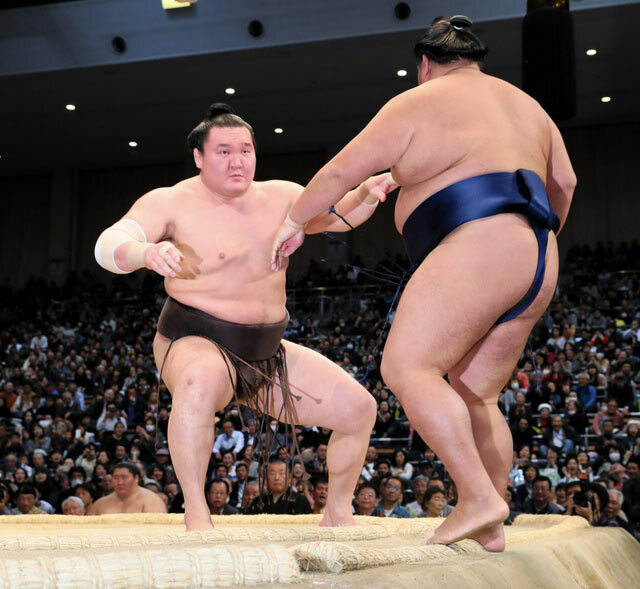 Meanwhile, Hokutofuji (10-2) defeated ozeki Takayasu (8-4) when he pulled his opponent forward in their third career encounter. 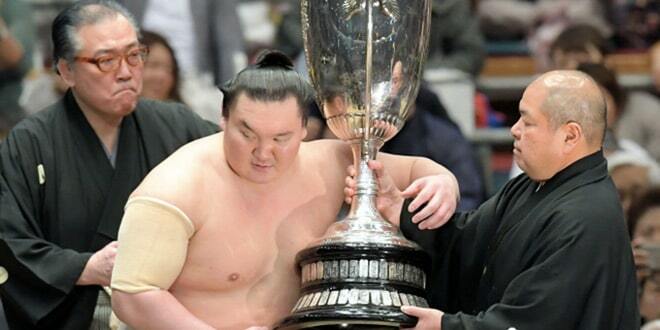 Fourth-ranked maegashira Ichinojo (8-4) secured his winning record by beating ozeki Goeido (7-5). 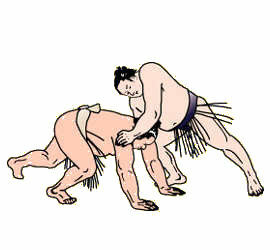 The two wrestlers held each other’s belts in the center of the raised ring, but the Mongolian earned the victory with an overarm throw. Fan-favorite No. 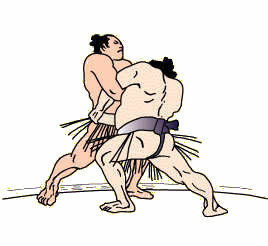 9 maegashira Endo won his sixth straight bout, defeating No. 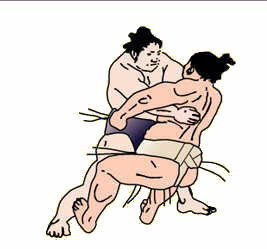 15 Myogiryu (6-6) with a textbook « oshidashi » frontal push and is the only wrestler with a 9-3 record. Fifth-ranked maegashira Arawashi (8-4) and top-ranked Takakeisho (8-4) secured winning records as they beat No. 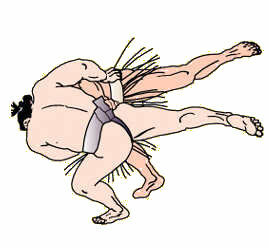 10 Kaisei (7-5) and No. 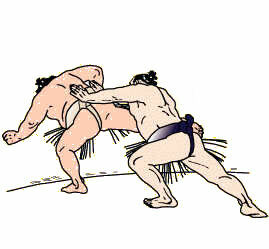 1 Tamawashi (8-4), respectively.